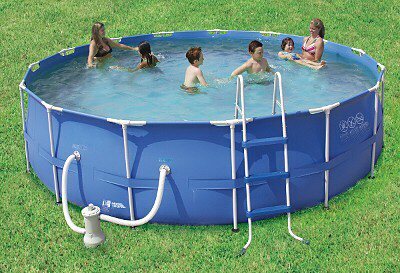 This 15' x 48" round frame pool comes with everything needed including a 1,000 GPH�skimmer pump. No tools are required to set up because it uses a quick connect system. The frame parts are powder coated, so they are rust resistant. The strong sidewalls are made with triple layer polystrength PVC with an inner mesh for extra strength and durability. 4,440 gallon water capacity of 80% full!